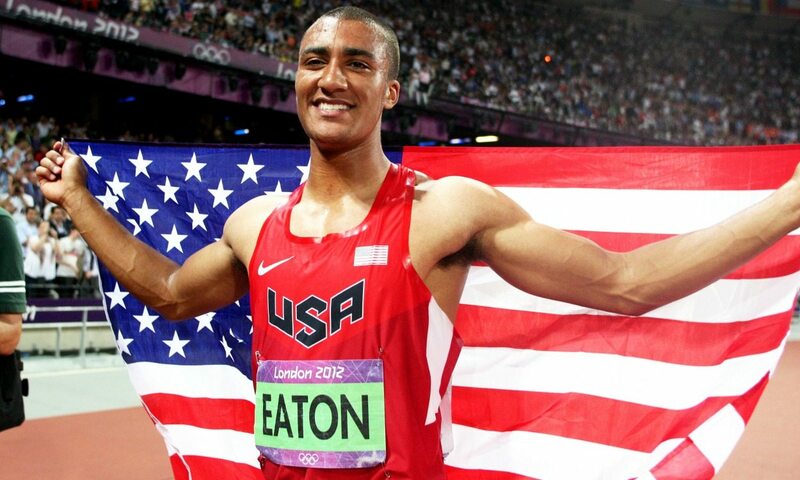 Defending champion Ashton Eaton is a class apart. He won in London by just under a 100 points but more significantly won world championships gold in Beijing by 350 points in setting a world record score of 9045. Barring injury or a no height, the American will win easily. Canadian Damian Warner was the closest to him in China while former world champion and London silver medallist Trey Hardee ranked second during 2015 with his USA trials score. World bronze medallist Rico Freimuth may well head the European challenge. His German team-mate Michael Schrader is the most consistent performer as he had three marks between 8415 and 8419 in 2015. Cuban Leonel Suarez has finished third in the last two Olympics but only ranked 32nd during 2015. There was no decathlon in the first modern Games in 1896 or in 1900 but there was a ten-event competition in St Louis 1904 which was called All-around Championship and it was held on the same day. The event consisted of most of the current 10 events but a walk, 56 pound weight throw and a hammer instead of the 400m, discus and javelin. The winner was Ireland’s Thomas Kiely, who was asked to compete for Great Britain but refused. The former world hammer record-holder was especially dominant in the weight throw and hammer. As Ireland weren’t officially a separate nation then he is listed as British in the records. There was also a three event triathlon consisting of a long jump, shot and 100 yards won by American Max Emmerich. In 1906 in Athens there was no decathlon, but there was a pentathlon which consisted of the same five events as in the ancient games – a standing long jump, Greek-style discus, javelin, 192m race and Greco-Roman wrestling – and was done on placings and Hjalmar Mellander won with 24 points, with the wrestling the only event he was in the top three in. There was no all-round competition in 1908 but there was a decathlon, with the current 10 events and a pentathlon with a long jump, javelin, 200m, discus and 1500m. Jim Thorpe, who was a top-class American football player and the 1912 intercollegiate ballroom dancing champion, dominated both events. In the pentathlon, he won three of the first four events and as it was on placings, and he was so far ahead, he didn’t even need to compete in the 1500m, but he won that too. It was his first decathlon and there were so many competitors it was held over three days. He won very easily, improving the world record by over a 1000 points and it would have still won the silver in 1948. His 1500m time of 4:40.1 was actually quicker than world record-holder Dan O’Brien ran in winning the 1996 gold medal in Atlanta. Thorpe returned to the USA a national hero but in 1913 it was revealed a few years earlier he had earned $25 a week in minor league baseball and he was declared a professional and ordered to give his gold medals back. A campaign to get him reinstated took 70 years and in 1983, 30 years after his death, his family was presented with the gold medals. Norway’s Helge Lovland, who was only fifth in the pentathlon, won the decathlon in Antwerp in 1920 well below Thorpe’s level. Eero Lehtonen of Finland won both the 1920 and the 1924 pentathlon and the event wasn’t held again. The 1924 decathlon in Paris was won by high jump champion Harold Osborn in a world record 7711 on the tables used then, though it was inferior to Thorpe’s effort. In Amsterdam in 1928, Paavo Yrjola broke his own world record with 8053 points. Runner-up Akilles Jarvinen was also second in 1932, and would have won gold in both events under the current tables. The winner in Los Angeles was American James Bausch who set a world record 8462 points whose decathlon career only lasted just over a year. A new set of tables were brought in 1934. In Berlin in 1936, American Glenn Morris was told he needed to set a 16 second PB of 4:32.0 to break his world record. He was disappointed despite his 4:33.2 clocking but was later told he had broken the record. He later went to appear in films in Hollywood. In 1948 in London, Bob Mathias won just three months after taking up the event and at the age of 17 became the youngest ever winner of a track and field gold medal. There were again new tables introduced in 1950 and Mathias was now stronger and faster and he improved his world record to 7887 as he won by an incredible 900 points as he scored 7887, which translates to 7580 under current tables. Milton Campbell was a distant second but returned in 1956 in Melbourne a much better athlete to go close to the world record but beat Mathias’s Olympic record. The world record-holder Rafer Johnson had injury problems but came second and then four years later, having improved the world record in the meantime to 8683, he had a great duel in Rome with Yang Chuan-Kwang. His rival was also from the same college – UCLA – but was competing for Taiwan. The points changed yet again in 1964 and the Tokyo event that year was a close affair with German Willi Holdorf just winning. American Bill Toomey, who was to marry Britain’s 1964 long jump gold medallist Mary Rand, won in Mexico in 1968 and set an Olympic record of 8193. He was world record-holder by the time of Munich 1972 but he lost it to Soviet Mykola Avilov who set or equalled eight PBs in winning easily with 8454 points. His fellow Ukrainian Leonid Litvinenko moved from eighth to second with a very fast 4:05.9 1500m. Bruce Jenner was tenth in Munich but was record-holder by the time of Montreal in 1976. Now famed as Caitlin Jenner after an operation, the American improved his record to 8618 points as Guido Kratschmer and Avilov pushed him hard. Britain won the next two Olympics (see British successes below). East Germany won gold in 1988 through Christian Schenk and then Czechoslovakia took an easy gold in Barcelona in 1992 with Robert Zmelik winning the title. A month after the Olympics, 1991 world champion Dan O’Brien, who had been the favourite for 1992 until no-heighting in the pole vault in the US trials, set a world record of 8891 points to break Daley Thompson’s eight year-old record. In Atlanta O’Brien won easily with 8824 points. Roman Sebrle, who had been second in 2000 (see most memorable Olympics), became the first athlete to break 9000 points in the event in 2001. The Czech won in Athens in 2004 with an Olympic record 8893 points but was pushed all the way. An inspired Dmitriy Karpov, who led overnight with 4689 points and increased it until fading badly in the pole vault, led until the javelin where Sebrle bettered 70 metres. In the end Bryan Clay took silver with the best ever second place mark of 8820 with Karpov third with 8725 points. Clay went one better in Beijing in 2008 and won easily. USA won again in 2012 as Ashton Eaton, who had only been second in the 2011 World Championships, comfortably took gold from world champion Trey Hardee. The favourite was double world champion Tomas Dvorak, who was also world record-holder with 8994 points, but he wasn’t at his fittest and he could only finish sixth. The early leader was Chris Huffins, who started with a 10.48 100m and he led overnight but only by eight points as Dean Macey came into contention with a 46.41 400m. Estonian Erki Nool was third overnight. Huffins’ lead was 196 points after the discus and it was Czech Roman Sebrle who was now second. Nool looked like he might be out of the competition as after two no throws, he appeared to touch the edge of the circle and a red flag was raised. After an Estonian protest he was reinstated. A strong pole vault and javelin then saw Nool move up to second before the 1500m. Huffins still led and was a notably poor 1500m runner but he took 12 seconds off his PB to do enough for a medal but it was bronze as 74 points covered the top four with Nool winning from Sebrle by 35 points. Macey ran a PB 4:23.45 but fell 28 points short of Huffins. The 1904 champion Thomas Kiely is listed as British in the records but the UK had to wait until 1980 for their first medal. In Montreal in 1976, Daley Thompson, at the age of 18, was the youngest competitor and finished 18th. In 1980, he was at a different level. Knowing world record-holder Kratschmer wouldn’t be in Moscow because of the boycott, Thompson took him on in Gotzis and broke the German’s world record with 8622 points in winning. In Moscow, Thompson didn’t need to be at his very best to win gold with 8495 points. The Briton broke the world record in winning European Championship gold in 1982 and also won the inaugural world title in 1983 but lost his world record to Jurgen Hingsen and the pair clashed in the Olympics Los Angeles in 1984. Thompson dominated initially with a 10.44 100m and 8.01m long jump but Hingsen fought back and briefly took the lead overall during the discus but Thompson responded with his final throw of 46.56m and with the German fading in the pole vault, the Briton went clear. Thompson only needed 4:34.98 to break Hingsen’s world record but he ambled through the line unconcerned in 4:35.00 and only equalled the mark with 8798 points. Although later when the points were re-scored in 1985, the Briton became outright record-holder with 8847 points. He finished fourth in Seoul in 1988, losing a medal by 22 points as Dave Steen took 22 seconds out of him in the 1500m. Defending London Marathon champion says a women-only world record could be on the cards for Sunday.